Country Sunshine lives on a small farm in rural Texas, and enjoys sharing tips and stories about her experiences in the country. 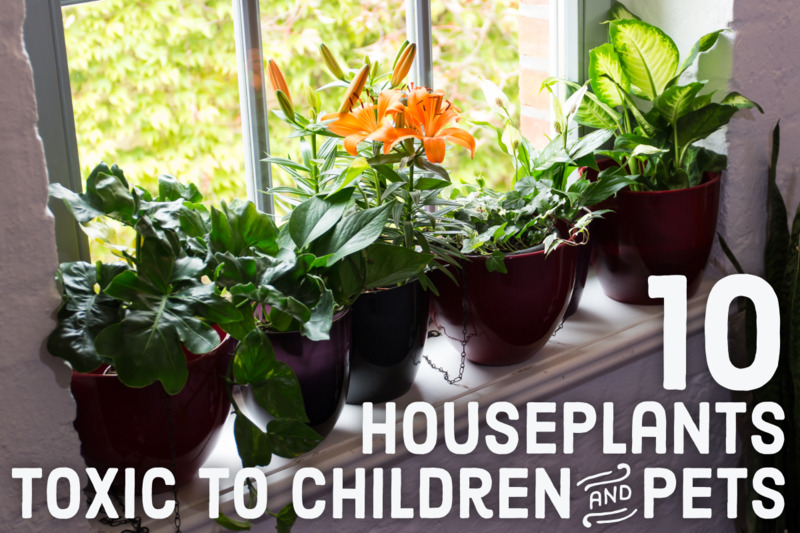 Planting flowers and herbs is a traditional spring activity, even when you are a novice gardener. You can plant flowers in clay pots or garden boxes, but why not plant them in old discarded boots? 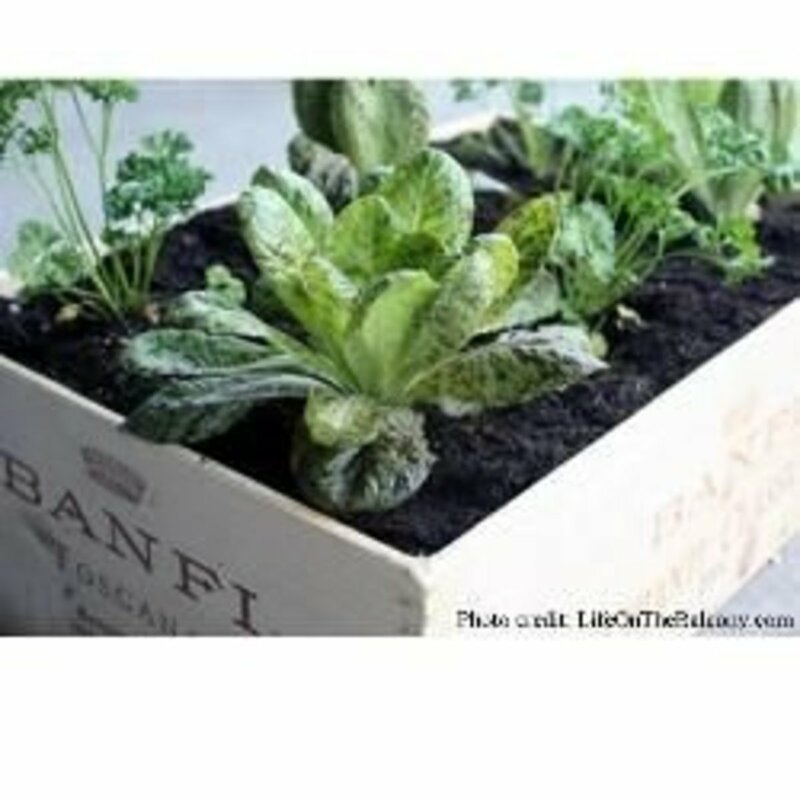 It is an easy, do-it-yourself project, that even the beginner can accomplish. You probably have an old pair of boots of shoes you no longer wear, but hate to throw out. Making a boot planter is a fun and easy way to keep your boots, and also put them to good use! It only takes a few minutes to make a boot planter. 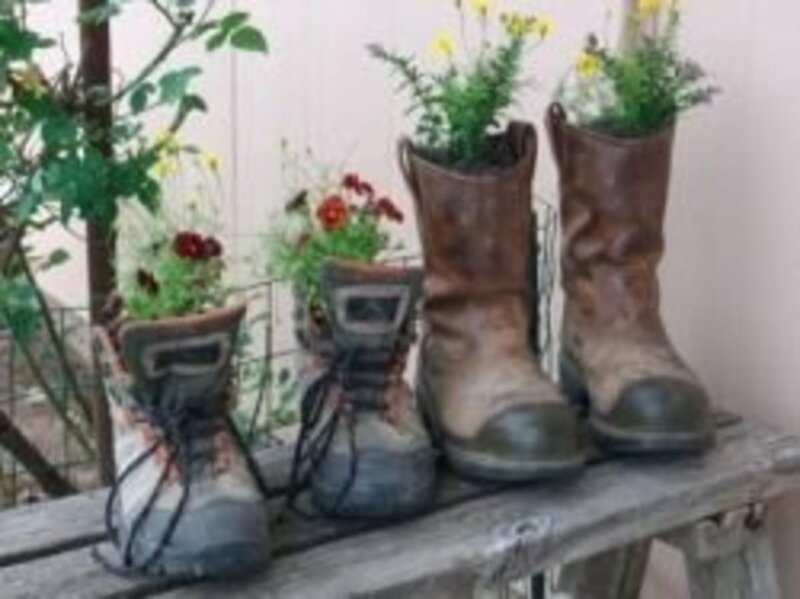 All you need is a pair of boots, a drill & drill bit, potting soil, and some flowers to plant. Look in your closet or out in the garage to find some old boots. If you don't have any laying around, perhaps you can pick up some at your local thrift store. 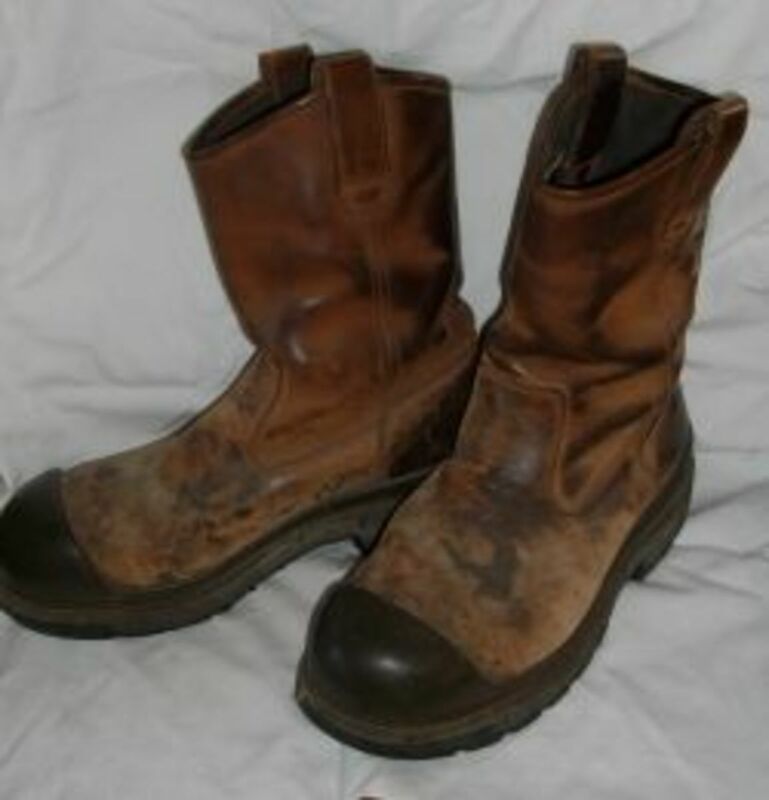 Boots can be made from any material, although rubber and leather are the easiest to work with. After choosing your boots, remove the insoles, and discard them. My boots had two insoles in each boot, so make certain you have removed all. It is important to drill holes in the bottom of your boots to allow for drainage. 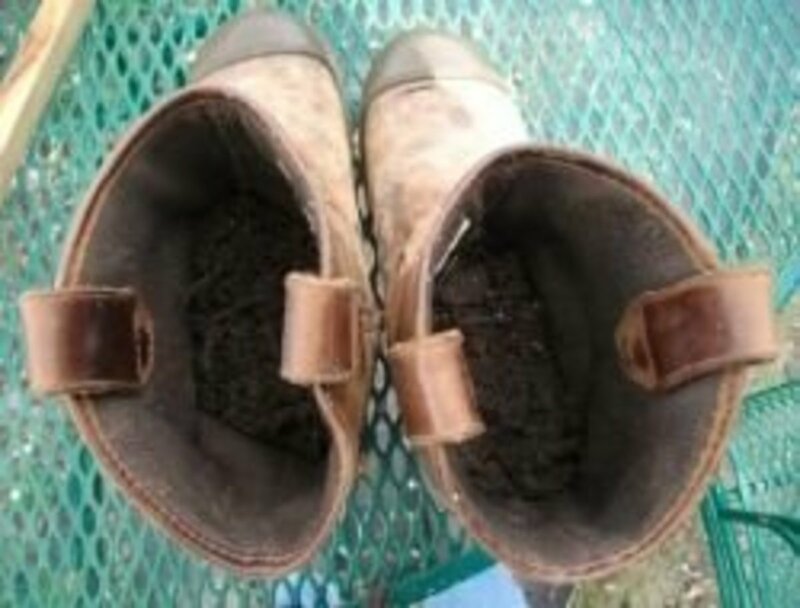 If water stands inside your boot, the roots may get moldy and rot on your plant. 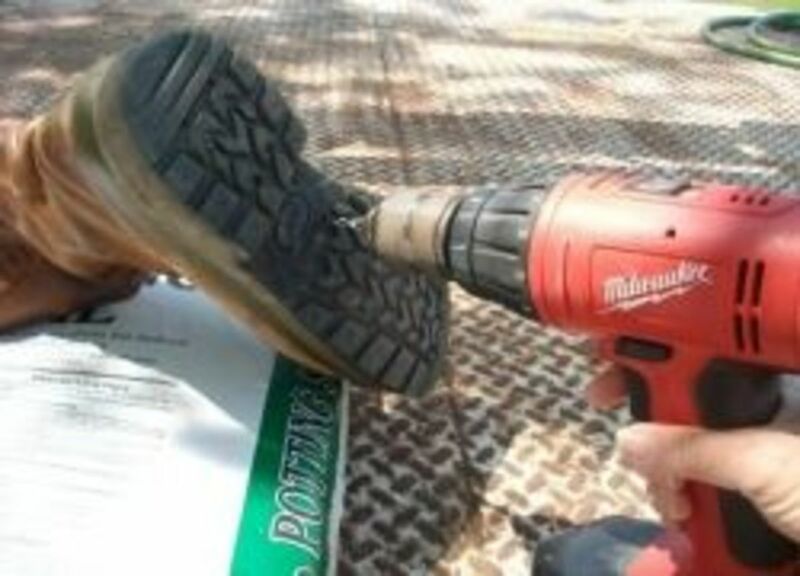 To make drainage holes, use a large bit, hold it against the bottom of your boots, and drill holes about an inch apart. If you do not have a drill, use a hammer and large nail to punch holes. Set your boots upright, and fill them with potting soil. Add soil to the toes first, then fill the boot about halfway up to the top. If you want to ensure good drainage and keep potting soil from leaking out the bottom of your boots, you may wish to put small stones or gravel in the bottom of the boot before adding the potting soil. 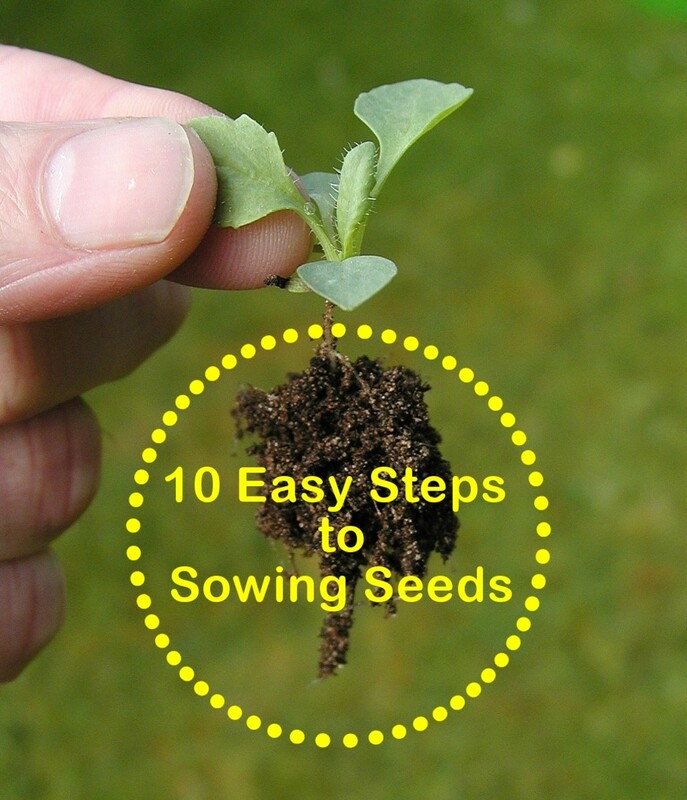 Make an indentation, or hole, in the potting soil a little larger than the size of your plant's root ball. 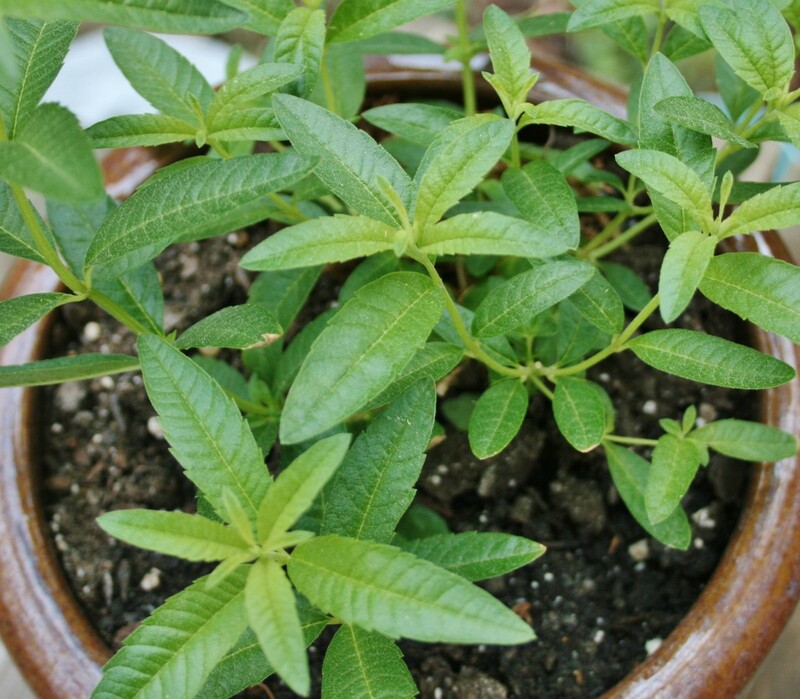 Carefully remove your plant from its plastic pot, and place it in the indentation. Using additional potting soil, cover the base of the plant, filling the boot up to the top. Using a watering can, or the spray nozzle on your garden hose, water your flowers immediately and thoroughly. 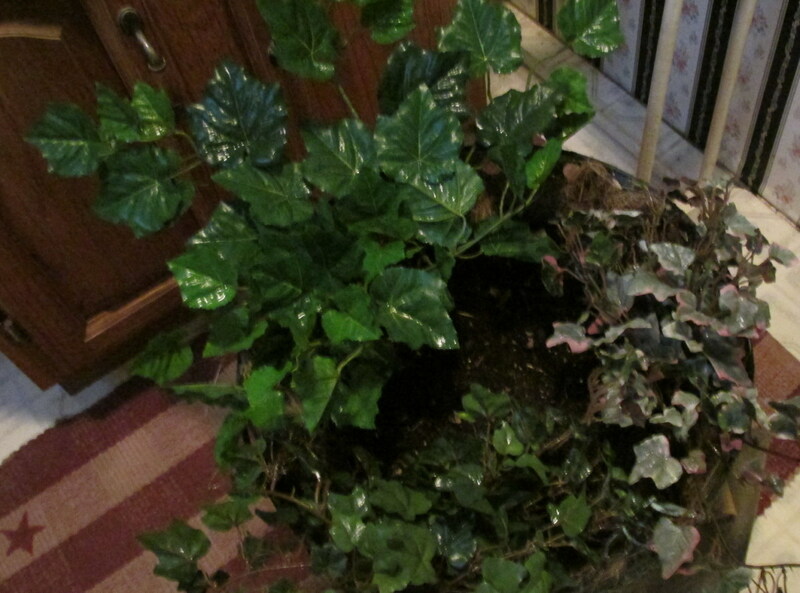 If the potting soil settles down into the boot, add a bit more soil and water again. The potting soil in your boot planters will dry out fairly quickly, so you'll need to water your plants frequently. If you do not have the time to do this, consider purchasing watering globes. The globes are made of glass, and add colorful interest to your boot planters. Just add water, and your flowers will stay nice and damp for up to 2 weeks. Depending on what type of flowers you planted, find a shady place on your porch or a sunny spot in your garden to show off your new boot planters! You'll find after making one pair of boot planters that you will want to make more! Use old boots - or even shoes - of different heights, or decorate your boots with paint to add interest. Recycle your old garden pots and pans into unique flower planters. How long do boot flower pots last? I'd like them for many years to come, since they belonged to my late son. Most likely, you will have to replant the flowers each year. 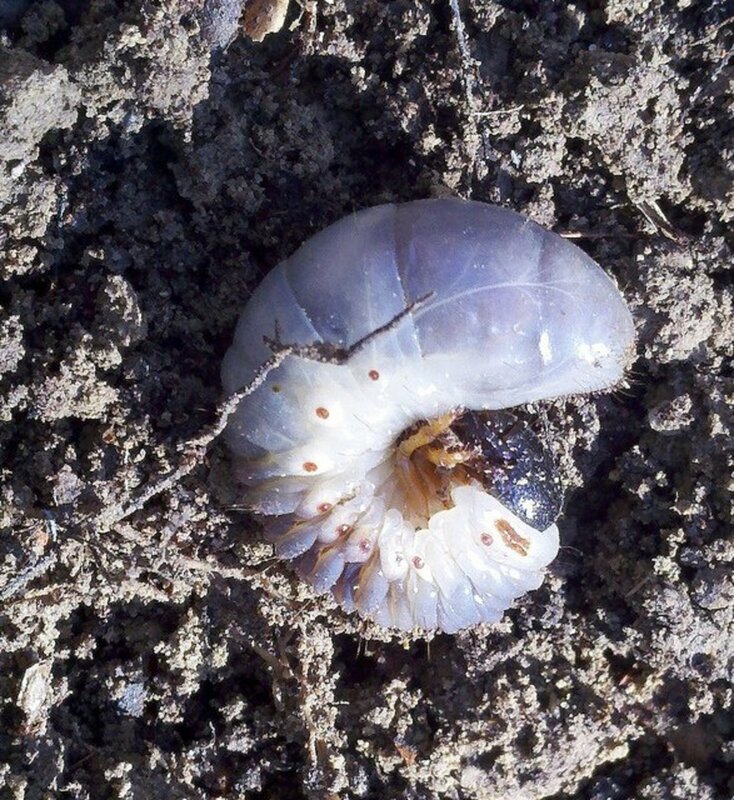 I do have some with perennial plants, but they don't always come back. As for the boots, I have replanted the same ones for the past eight years, and they are still in good shape. I imagine the longevity is based on the quality of the boots. I have a pair of awesome blue suede boots that I would love to turn into flower pots. Do I need to put a coat of something on the outside of the boots beforehand? Or will my suede be ok? If you are using the boots as outside flower pots, you will probably need to put something on there. Water and weather can damage suede. I would imagine some type of waterproofing solution for suede would work perfectly. Check with the manufacturer of the boots, or a shoe store for recommendations. Do you own any unusual flower pots? Have you ever made boot planters? Please share your ideas and tips here! It is such a fun project, and can be done year after year. I add more pairs of boots to my "shoe garden" each spring, and love the way they turn out. Hope yours turns out beautifully as well! I can't thank you enough for this wonderful tutorial. This is a project I've been wanting to do and now with your help I can finally get started. Really excited about this. Up and sharing. I know many people plant hens-n-chicks and other succulents in boots. I happen to enjoy the colors and textures of flowers, so that is always my first choice when planting my boots. If you get a chance to try this, I hope you'll share photos! I have always wanted to do this. Well...for a couple years anyway! lol I have never seen anything but the succulents planted in them so you give a whole new realm of ideas! Thank you. I love ideas like this one. I saw a picture once of like fifty rubber boots nailed to a fence, and each one was a planter. It looked cool because all of them were different colors. Anyway, I like this idea and I'll do it in the spring. Thank you and Happy Thanksgiving to you and yours. Thank you, Patsybell! I hope you get a chance to make some of these yourself next spring! I like your idea. The step by step guide lines are easy to follow. Voted up ++ Pin. I actually saw a boot planter the other day when I was tooling around the net. Wish I hadn't gotten rid of my combat boots. Great lens. What a cute idea! I tend to use the newer lightweight pots so that I can move them around on my deck but I do have a pair of old boots hanging around that might be begging for some hen and chicken cactus. These do look good around the garden, I must say! Thanks! This is a very creative idea. I will start to make boot planters. Thanks. Nice idea about making boot planters and will be back to read more. What a great idea to use old boots, and the planters look great too. An old worn out shoe can look so cute as a planter, beautiful green idea. Pretty Cool! What about high heel planters for delicate flowers. Do you think this would work? You get a Squid Like from me! Great idea, much better than throwing them away. I do a lot of gardening so I will give it a go. I don't have anything unusual but I do seem to recall a neighbor who placed a toilet in her front yard and used that as a planter. I love different types of planters. I have an old shoe, toolbox, and an old wagon. 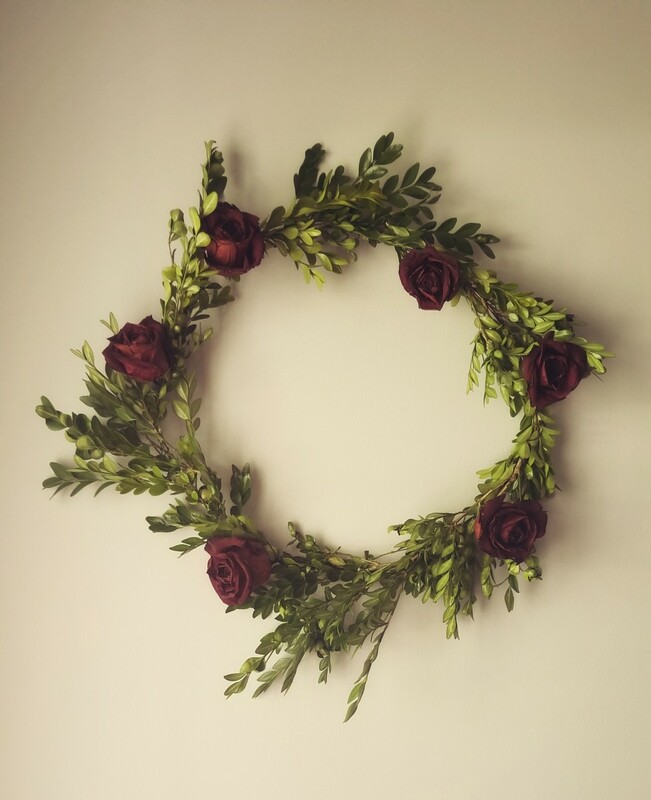 I did this once as a memorial for a family member who'd passed away. I thought a living, thriving lantana would make a wonderful memorial that wasn't morbid at all. Glad to see I wasn't the only person who thought of this. Nice lens! These are too cute. I like the ones that are done with crocs too. What a fun idea! I'm thinking my senior mom might enjoy adding this to her gardening activities. Thank you! I really love the contrast between the aged, worn boots and the fresh flowers. 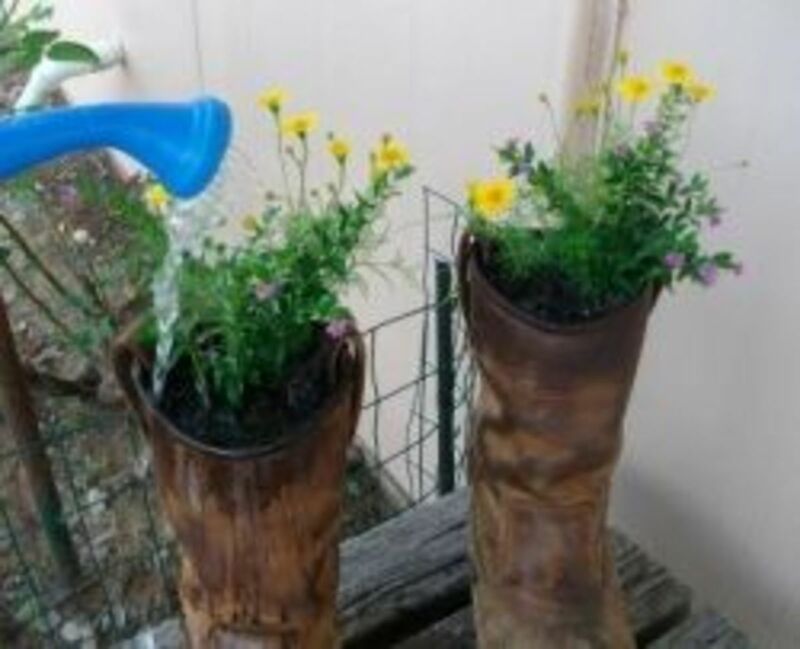 Very good and easy idea but it will be even nicer if you have rubber boots with floral motif or if you can paint that old boots ! Kisses ! These are really cute. I imagine a lot of people in my family would like them as gifts! Great idea and info. I have seen boots used as planters but had not realised you needed to drill holes in them for drainage. Obvious really, but I would just have filled them with soil and wondered why the plants died! Very cool. I am definitely going to try this. What a brilliant idea, look funky as well. Thanks. Interesting use for old shoes and boots. Much better than trashing them. Thanks for the suggestion. These are cool to look at. I have some Doc Marten boots that I no longer use. I made an old purse into a planter. Thought of doing boots. Yours look great. What a cool idea! One could get very artsy with this! Thanks for this information! What a great lens ! Never thought of using boots for this.... Worth experimenting this ! Cute planters, and what a great idea!!! 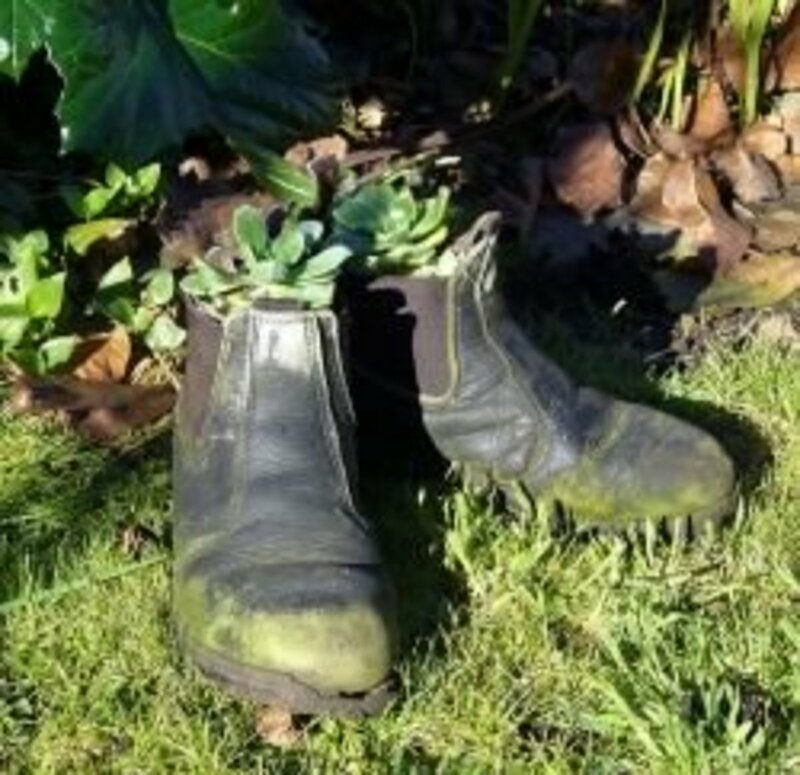 What fun to find another gardener who plants in old boots! I stack them on an old wooden ladder in our garden! That is so creative. Ugly beauty,.... I like. This is a clever idea for repurposing old boots. I would have to find some at the thrift store. I've seen cowboy boots turned into bird feeders too. Very nice! Might shock someone if they didn't know about it? I guess it is a good way to let your shoes go back to the earth... Fun! Oh I love this very creative idea! Clever, especially if you cannot wear your favorite pair of boots anymore but don't want to part with them. There is a coffee shop near where I live that has these boot and shoe planters in front of their shop. Very cute idea and well done lens. 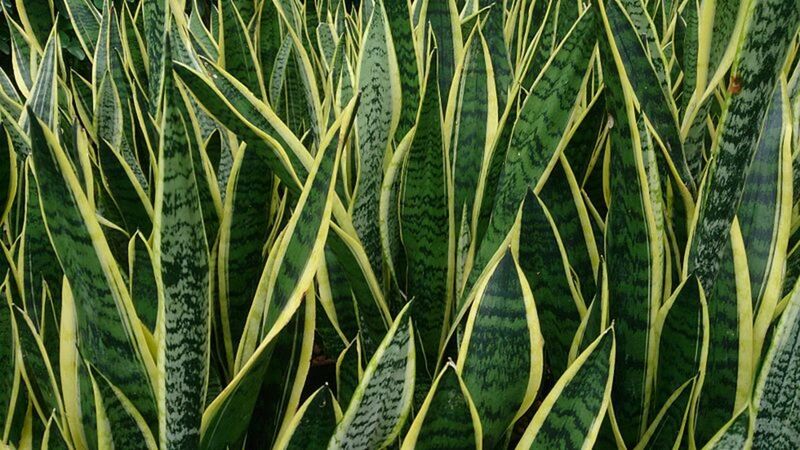 They look great, and would really add some interest to the garden! How creative! I love planting in unique and unusual ways, but I had never thought of old boots (just about anything else old has worked for me). What a cleaver idea. I think I'll try it. Great lens! I've seen others use old boots as planters, but I've never tried it myself. I might just give it a try thanks to your helpful step-by-step instructions.